Ensure adequate access to food, provide a pleasant dining experience with adequate assistance to eat, and offer favorite foods. The term “failure to thrive” (FTT) has been used to describe older adults who were once active and are now socially withdrawn, lonely, bored, and depressed. FTT in older adults has been described as “a syndrome manifested by weight loss greater than 5% of baseline, decreased appetite, poor nutrition, and inactivity, often accompanied by dehydration, depressive symptoms, impaired immune function, and low cholesterol levels.”1 It may result from issues such as chronic disease and functional decline, physical and emotional deprivation, poor appetite, poor diet, or medical problems.2-4 All of these combined can easily lead to inadequate food intake, malnutrition, unintended weight loss, weakness, functional decline, and other complicating factors such as falls, impaired immune response, and poor wound healing. Because the decline in condition is so gradual, loved ones often fail to notice the subtle changes in health status. If changes are noted, the older adult often denies there is anything wrong, and treatment may be delayed until there is an acute illness or event. Healthcare professionals often realize at the time of assessment related to the acute event that there has been a decline that usually includes poor food and/or fluid intake, unintended weight loss, undernutrition, and inactivity. Later adverse outcomes include protein energy malnutrition, depression, cognitive impairment, and impaired physical function. Medical conditions associated with FTT can include cancer, congestive heart failure, chronic lung disease, chronic renal insufficiency, chronic steroid use, cirrhosis, cardiovascular accident, depression or other psychological disorders, diabetes, hepatitis, hip or large bone fracture, inflammatory bowel disease, a history of gastrointestinal (GI) surgery, myocardial infarction, recurrent urinary tract infection, recurrent pneumonia, rheumatologic disease (eg, rheumatoid arthritis, lupus), a systemic infection, or tuberculosis.2 Dentition, vision, hearing, continence, and GI issues must also be addressed. One of the most common symptoms of FTT is unintended weight loss that can result in undernutrition or protein energy malnutrition if left untreated. It is important to quickly and accurately identify older adults at risk of malnutrition. There are three validated tools that may be used for nutritional screening: The Mini-Nutritional Assessment Short Form, the Malnutrition Universal Screening Tool, and the Short Nutritional Assessment Questionnaire. These tools can help determine which patients need to be referred to a registered dietitian for a comprehensive nutrition assessment and appropriate nutrition interventions. In the outpatient and home care setting, another commonly used nutrition screening tool is the Determine Your Nutritional Health checklist. Depression is common in FTT, and it may be either a cause or a result of the syndrome. Depression can be a major cause of unintended weight loss, and if left untreated, it is associated with increased morbidity and mortality in FTT patients. The Geriatric Depression Scale is a commonly used tool for assessment of these symptoms. Cognitive impairment can be the result of multiple factors, including abuse or neglect, a lack of support, recent personal loss, medications, chronic disease, malnutrition, electrolyte imbalances, and dehydration. Cognitive status should be evaluated frequently due to potential frequent changes in overall health status and condition.2 The Mini-Mental State Examination is the most common and valid screening tool used to assess cognitive disorders. The goal of medical interventions should be to improve overall quality of life and functional abilities. Treatment is best achieved through a team approach: a physician, a nurse, a dietitian, and/or a physical therapist along with a social worker, a mental health professional, and/or a speech pathologist as dictated by individual need.2 Easily treatable causes of FTT such as depression or poor nutritional intake should be addressed immediately. Nutritional status has a significant impact on an elder’s ability to recover and rehabilitate from illness, injury, or surgery. Malnourished older adults have diminished muscle strength, which can lead to weakness, decreased independence, and falls. They may recover more slowly from illness or acute episodes or experience unintended weight loss, increased risk of pressure ulcers, poor healing rates, anemia, fatigue, susceptibility to infection due to immune dysfunction, and ultimately increased morbidity and mortality. Loss of muscle mass is an indicator of protein-energy malnutrition. Sarcopenia (loss of muscle associated with aging) can exacerbate the difficulties challenging the health of an older adult above and beyond issues related to FTT. Generally, people start losing muscle at about the age of 45 and tend to continue losing muscle at a rate of about 1% per year. This muscle loss leads to decreased strength and ability to perform everyday tasks. In addition, unsteadiness may result in falls. There is some evidence that physical activity and protein intake can help prevent or slow the progression of sarcopenia, according to the second edition of the Handbook of Clinical Nutrition and Aging. LBM makes up 75% of body weight, mostly in the form of muscle, bone, and tendon, and provides the majority of the body’s protein. Loss of just 10% of LBM decreases immune response and increases the risk for infection. With an LMB loss of 15% or more, the rate of wound healing decreases and weakness increases. At 30% loss, pressure ulcers may develop and healing response is nonexistent. A 40% LBM loss usually results in death (often due to pneumonia).8 Unfortunately, the rate of LBM recovery is much slower during the recovery stage than the rate of loss during the inflammatory stage. The goal of medical nutrition therapy should be to improve quality of life, stabilize or reverse unintended weight loss and malnutrition, and treat any identified problems. 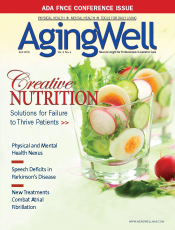 Common nutritional problems for older adults include an inability to consume adequate calories or protein to meet needs, overly restrictive diets (liberalized diets can help to improve food intake), dysphagia, and depression, according to a 1995 article in the Annals of Internal Medicine. It is important to remember that even if an elder is overweight, he or she may still have a low LBM (ie, sarcopenic obesity). One of the most important nutrition interventions is to ensure adequate calorie and protein intake. This can be achieved by ensuring adequate access to food, providing a pleasant dining experience with adequate assistance to eat, offering favorite foods, individualizing to the least restrictive diet appropriate, using enhanced or fortified foods, providing oral nutritional supplements, and using appetite stimulants or enteral feeding if appropriate. Some older adults need vitamin and/or mineral supplementation. A daily multivitamin/mineral supplement is suggested for most older adults with poor food and/or fluid intake.8 Individuals who experience anorexia, food aversions, or loss of appetite may benefit from alternative interventions such as appetite stimulants or enteral feeding if they’re in the best interest of the patient and in accordance with goals and desires. • Endurance to improve the cardiovascular and circulatory systems (low-impact exercises). • Balance to prevent falls. Balance exercises may include tai chi (improves balance) or something as simple as standing on one leg with eyes closed, though older adults may need to hold on to something while doing this. • Flexibility to recover from or prevent injuries may help prevent falls (ie, yoga or stretching exercises), according to the NIH. Nutrition and exercise together have a synergistic effect that helps combat malnutrition, increase strength, and promote well-being. Encourage physical activity and suggest age- and ability-appropriate exercises, including walking and strength training. Refer patients to a physical therapist to assess range of motion, strength, and endurance and to determine the need for assistive devices such as canes, walkers, grab bars, or shower chairs. Determine whether an elder can benefit from continued physical therapy, occupational therapy, or strength training and refer to social services for a home environment assessment as appropriate. Adequate energy and protein are needed to meet needs and support muscle synthesis and repair. Adequate food intake that meets caloric, protein, and nutrient needs combined with regular physical activity and strength training are key interventions that may help combat FTT and preserve and enhance strength. By being aware of each individual’s conditions, problems, and concerns related to nutrition and physical activity and working with an interdisciplinary team to address medical and nutritional concerns, you can provide the most appropriate interventions. — Becky Dorner, RD, LD, is founder/president of Becky Dorner & Associates, Inc, a dietetic education/information firm, and Nutrition Consulting Services, Inc, a dietetic consulting firm, both based in Akron, Ohio. Her website is www.beckydorner.com. 1. Institute of Medicine Committee on a National Research Agenda on Aging, Division of Health Promotion and Disease Prevention. Extending Life, Enhancing Life: A National Research Agenda on Aging. Washington, D.C.: National Academies Press; 1991. 2. Robertson RG, Montagnini M. Geriatric failure to thrive. Am Fam Physician. 2004;70(2):343-350. 3. Woolley DC. How useful is the concept of ‘failure to thrive’ in care of the aged? Am Fam Physician. 2004;70(2):248,257. 4. Lantz MS. Psychiatry rounds: Failure to thrive. Clinical Geriatrics. 2005;13(3):20-23. 5. Mitchell-Eady CO, Chernoff R. Nutritional assessment of the elderly. In: Chernoff R (ed). Geriatric Nutrition: The Health Professional’s Handbook. 3rd ed. Sudberry, Mass. : Jones and Bartlett Publishers; 2006. 6. Furhman PM, Charney P, Mueller CM. Hepatic proteins and nutrition assessment. J Am Diet Assoc. 2004;104(8):1258-1264. 7. Morley JE, DiMaria RA, Amella E. Frailty and the older adult: Features, vulnerabilities, and feeding. Clinical Nutrition Week. January 30, 2005. 8. Demling RH, DeSanti L. Involuntary weight loss and the nonhealing wound: The role of anabolic agents. Adv Wound Care. 1999;12(Suppl 1):1-14. 9. Piland C, Adams K, eds. Pocket Resource for Nutrition Assessment. Chicago: American Dietetic Association; 2009. 10. Litchford M. The Advanced Practitioner’s Guide to Nutrition and Wounds. Greensboro, N.C.: Case Software and Books; 2009. 12. American Dietetic Association Evidence Analysis Library, Unintended weight loss in older adults. Available at: http://www.adaevidencelibrary.com/topic.cfm?cat=2948. Accessed August 4, 2010. 13. Niedert KC, Dorner B, eds. Nutrition Care of the Older Adult: A Handbook for Dietetics Professionals Working Throughout the Continuum of Care. Chicago: American Dietetic Association; 2004. 14. Federal Interagency Forum on Aging Related Statistics. Older Americans 2008: Key Indicators of Well-Being. Washington, D.C.: U.S. Government Printing Office; 2008. 15. Mead Johnson Advisory Board for Geriatric Health and Nutrition. Recuperative powers of nutrition: Resistance, recovery, rehabilitation monograph. Mead Johnson Nutritionals, Mead Johnson & Company, 2003. • Launch a thorough investigation of older adults who experience decline in vigor, weight, or function. • Examine older adults’ psychosocial, economic, spiritual, and emotional needs as well as social/environmental factors. • Review medications to identify possible drug-nutrient interactions, drug-drug interactions, polypharmacy, and adverse side effects of medications. • Identify nutritional deficits and make appropriate diet modifications. • Encourage exercise to improve endurance, strength, balance, and flexibility.